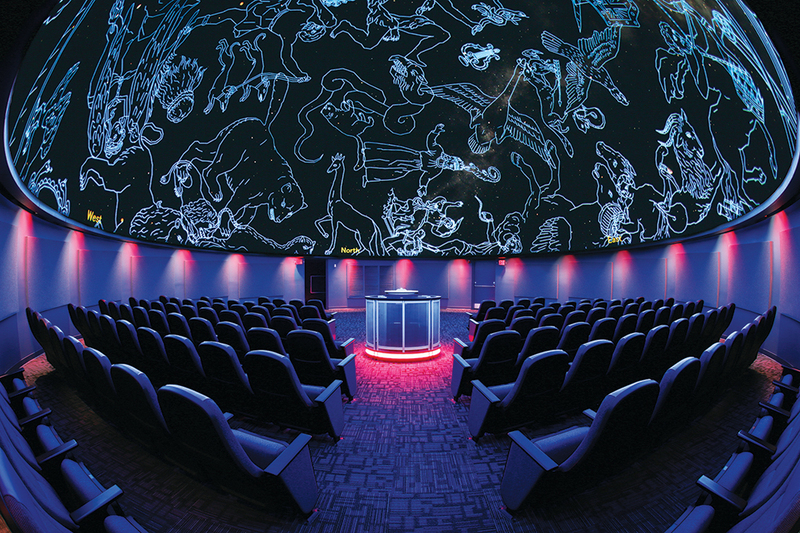 Explore space, the constellations, and planets visible from Central Georgia in Sky Over Macon in the Mark Smith Planetarium. The show starts with a general tour of the celestial sights visible each season; then a live presentation updates the current position of the planets and unusual events in the sky. This program provides the latest information about current and upcoming celestial events for those who want to learn how to find constellations or planets in the sky or how to increase their knowledge of astronomy. The show begins at 8:15 pm (doors open at 8:00 pm) and regular Museum admissions apply. The Planetarium seats 120, and seating is on a first-come, first served basis. This show is not recommended for children younger than 4 years old. Children 3 and under will not be admitted. Join us in the Observatory after the Planetarium’s Sky Over Macon show to see the real night sky through our telescopes! Observing, which is free for all, begins after the Planetarium show and lasts until 10:00 pm if the sky is clear.